The core program of Literature to Life is designed to teach classic literature by bringing it to life! In authentic costumes and with a dramatic flare, Sloane creates a world where the past comes alive and offers relevance to our modern world. For example, when Frankenstein's monster expresses feelings of extreme loneliness and isolation, it has a little more meaning when you realize Mary Shelley wrote those emotionally tormented chapters after reading the suicide note of her half-sister. Although many classic novels were written during the Victorian era, this program is not restricted to only Victorian era novels. As mentioned, you couldn’t have a complete list of ‘classic literature’ without Frankenstein! ​or a printed copy of the lecture catalog. What a fun way to start off a book club event! Choose from any of the classic novels listed below; it will be enthusiastically presented in general terms and with lots of interesting information about the characters and (when available) the author. Sloane will always be dressed in a costume from the setting of the novel. In your home or a banquet room, for 5 people or 50, it is your night and the novel of your choice. Enjoy!! ​A cultural event for the young and young-at-heart! 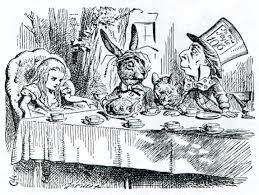 Set up your own beautiful tea setting and enjoy a presentation about classic works from children's literature! Play dress up with the young ones in your life (or your adult book-loving friends!) and experience an event that could inspire a life-long love of reading! Approximately an hour long, you will learn the history behind the novel (did you know that as a child, Charles Dickens worked in a blacking factory with a boy named Fagin? ), hear interesting details about the characters (did you know Dorothy's shoes were actually silver?) and even a dramatic reading of an excerpt from the story. Revive your love for (or be introduced to) classic stories in their original text. ​﻿A wonderful combination of Literature and Lore! Enjoy the setting of a lovely Victorian tea served with a juicy presentation of two notorious Victorian women: one from real life and one from literature! This is your opportunity to play dress-up and revel in the company of your lovely (and maybe a little naughty) friends. Approximately an hour long, the presentation includes a brief history of the Victorian era followed by a description of the two chosen Victorian women and what made them so naughty. Be sure to prepare lots of tasty treats to eat. Scandal does seem to make one hungry! Choose from the following naughty pairings or request a special combination to fit your occasion. Miss Christiana Edmunds: 'Death by chocolate' got a little too literal when this jilted lady decided to poison her lover's wife with strychnine-laced chocolates. Emma Bovary (from Madame Bovary): When all of her delusions of grandeur turned to disappointments, Emma decided to end it all by taking a mouthful of arsenic. Lizzie Borden: We all know the song... Lizzie Borden took an axe... or did she? Mrs. Lovette (from Sweeney Todd or The String of Pearls): As the 'business partner' of the barbaric barber, Mrs. Lovette chopped up his victims and served them with a smile! Lucy Audley (from Lady Audley's Secret): When George Talboys returns after 3 years in Australia, he learns his wife has died in his absence. Mourning, he goes to visit a friend, Robert Audley, who has recently wed a beautiful young lady... George Talboys' supposedly dead wife! Oops! And for some reason, pushing hubby #1 down a well doesn't fix all her problems. Go figure! The 'real life' pairing to this book is its own author, Mary Elizabeth Braddon! In 1862, when Lady Audley's Secret was published, Mary Elizabeth had moved in with John Maxwell, her publisher. Too bad he was still married to his 1st wife. Oops! Naughty naughty!! We all know the beloved Hollywood movie. But did you know it was inspired by a true story? Amy Archer-Gilligan ran a home for the elderly and infirmed. You could say she loved her residents to death! The Woman of the World is an absolute Victorian melodrama jewel! First published as a Penny Dreadful, it was adapted for the stage in 1859 And featured the naughty antics of Lisa Selby, a young lady who had deadly high ambitions. As a bonus, we will also learn about Madeleine Smith, a beautiful Scottish socialite who was accused of murdering her lover with arsenic!